Our lab organizes an IGSN Symposium entiteld "Psychophysics in humans and optogenetics in mice"
Our PhD Student Zohre Azimi participates in the G-Node Advanced Neural Data Analysis (ANDA) Course, Jülich-Barmen, Germany. The course is addressed to excellent master and PhD students and young researchers who are interested in learning advanced techniques in data analytics and in getting hands-on experience in the analysis of electrophysiological data. Internationally renowned researchers will give lectures on statistical data analysis and data mining methods with accompanying exercises. Brain stimulation methods, such as transcranial magnetic stimulation (TMS), offer new approaches to therapeutics for brain disorders. Jancke's group uses an innovative imaging method with voltage-sensitive dye to track at submilimeter range and high temporal resolution, TMS-induced plastic functional changes across the brain. 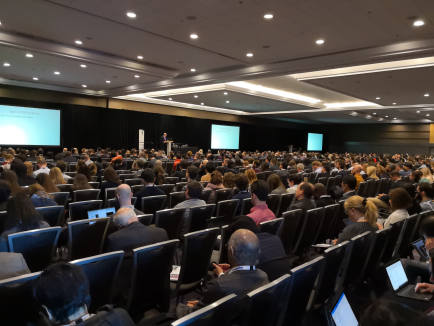 The conference program included 30 distinct 2-hour symposia, along with 12 plenary lectures, 3 poster sessions, and 4 Meet the Expert workshops. Dirk Jancke presents work from the lab at the Satellite Workshop entitled “Sensory neurons: Predictive coding or coding for predictions?" Our PhD students Zohre Azimi and Ruxandra Barzan present their results at the FENS Meeting in Berlin. Dirk Jancke presents recent work from the lab at FENS Satellite Symposium entitled “Receptive fields: analysis, models and applications. INI Seminar: Dirk Jancke talks about current developments in optical imaging. We are glad to welcome Matthew Chalk presenting his recent findings in our SFB 874 Colloquium. V1 Population Dynamics and Plasticity. Host: Thomas Knöpfel, Faculty of Medicine, Department of Medicine, Imperial College London, UK. Shaping activity patterns in V1: TMS-induced plasticity and context-dependent dynamics. Host: Michael Herzog, Carl Petersen, Brain Mind Institute (BMI), Lausanne, Switzerland. Context-dependent changes of V1 population dynamics. Host: John-Dylan Haynes, Bernstein Center for Computational Neuroscience, Charité, Berlin. Voltage-sensitive Dye Imaging of Brain Dynamics. Research Department Neuroscience, Ruhr University Bochum. Gonda Brain Research Colloquium, Dirk Jancke reports work of the German-Israeli Project "Decoding visual content and perception from neuronal population activity in visual cortex: VSDI, fMRI and computational modelling"
Our lab organizes an IGSN Symposium entiteld "Decoding Visual Content and Perception from Neuronal Population Activity in Visual Cortex: VSDI, fMRI and Computational Modelling"
Population dynamics across the visual brain imaged with voltage-sensitive dye. Faculty of Biological Sciences, University of Leeds, UK. VSD imaging as a tool to study functional activity at mesoscopic population levels. Host: Frederic Chavane, C.N.R.S. Marseille, France. Voltage-sensitive dye imaging of the visual brain: Capturing neuronal activity dynamics at the population level. Symposium Perspectives of Molecular Imaging in Systems Neuroscience, MPI für Biologische Kybernetik, Tübingen. Spatio-temporal dynamics of brain activity captured with voltage-sensitive dye imaging. Symposium Systems Neurobiology, University of Göttingen, 28-29. September, 2009. Voltage-sensitive dye imaging as a tool to capture large-scale activation dynamics across the brain. Host: Gustavo Deco, University Pompeu Fabra, Barcelona. Dynamic computation in early visual cortex captured by VSD imaging and parallel electrophysiology. International Workshop - Aspects of adaptive dynamics - Hanse Wissenschaftskolleg, Delmenhorst. From Luminance changes to Natural Scenes: Voltage-sensitive Dye Imaging in Primary Visual Brain Areas. German-USA Collaborative Symposium on Computational Neuroscience, Munich. Population dynamics induced by local motion visualized with voltage-sensitive dye imaging in primary visual cortex. Host: Thomas Wennekers, Centre for Theoretical and Computational Neuroscience, University of Plymouth, UK. Kortikale Aktivitätswellen in primären visuellen Arealen optisch registriert mittels fluoreszenter spannungsabhängiger Farbstoffe. Otto Witte, Interdisziplinären Zentrums für Klinische Forschung (IZKF) Jena Klinikum der Friedrich-Schiller-Universität, Jena. Cortical Activity Streaks evoked by Fast Moving Stimuli form to Patterns that Map Orientation of Motion Trajectories - Voltage-Sensitive Dye Imaging across Cat Primary Visual Cortex. Soc Neurosci Abstr 37. Population dynamics in cat early visual cortex evoked by local motion. Symposium 22: Real-time voltage-sensitive dye imaging of cortical network activities across sensory modalities. Shaping visual space from subthreshold activity in primary visual cortex: Combined voltage-sensitive dye imaging and electrophysiology in cat area 18. Host: Fred Wolf, Max-Planck Institut für Strömungsforschung, Bernstein Center Computational Neuroscience, Göttingen. Cortical activity visualized by voltage-sensitive dye imaging: Dynamics of subthreshold and suprathreshold activity patterns across primary visual cortex. Center for Computational Neuroscience and Robotics (CNNR) – University of Sussex, England. Shaping visual space from propagating subthreshold activity in early visual cortex - Voltage-sensitive dye imaging of neural network dynamics in real time. In: Symposium on Dynamical motion processing: new insights into the neuronal machinery, Uwe Ilg & Guillaume Masson. 5th Forum of European Neuroscience, FENS, Vienna, Austria. Shifting of position in primary visual cortex: Studying local stimuli dynamics using voltage-sensitive dyes. Andreas Engel, Inst. of Neurophysiology, Universitätskliniken Eppendorf (UKE) - Hamburg. Studying positional effects in cat primary visual cortex using voltage-sensitive dyes. Ray Dolan, Hakwan Lau, Wellcome Trust Functional Imaging Laborator, Institute of Neurology, University College London (UCL), England. Visualizing the Invisible: The functinal role of subthreshold cortical spread for the processing of local objects. Voltage-sensitive dye imaging in cat primary visual cortex. Henning Scheich, Leibnitz Institute of Neurobiology – Center for Learning and Memory Research, Magdeburg. Visualizing the invisible – Voltage-sensitive dye imaging of shaping suprathreshold activity from emerging cortical spread in early visual cortex. Satellite Symposium, ASSC9 Caltech, Pasadena, CA, USA. Imaging the influence of subthreshold activity on the representation of stimulus location in cat visual cortex. Uwe Ilg, University Hospital, Clinic for Neurology, Dept. Cognitive Neurology, Tübingen. Our lab organizes an IGSN Symposium entiteld "Modeling Cortical Information Processing"
Our lab organizes an IGSN Symposium entiteld "The Brain in Action: Optical Imaging of Vision and Touch"
Imaging Cortical Motion Trajectories in Early Visual Areas of the Cat. Bert Sakmann, Hartwig Spors, Max-Planck-Institut für medizinische Forschung, Heidelberg.